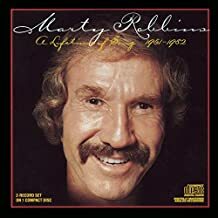 Not many of us know the vast number of songs that the great Marty Robbins recorded during his career. The more you listen to his music the more you come to realize what a wonderful voice he had and you never tire of listening to him. He had such a variety of music and his ability to deliver it was special. Marty Robbins left behind countless fans and friends not to mention his wonderful music. He is a legend that will live forever in the history of country music. We will always be grateful for him and his music. Thanks Marty, for leaving us so many wonderful songs that we can play and sing. Marty's music is very special and it’s a pleasure to play my old guitar and sing his songs. My wife and I take time everyday to play and sing from a collection of classic country song lyrics, it’s our passionate past time. Try it, singing makes one happy and it's very relaxing.